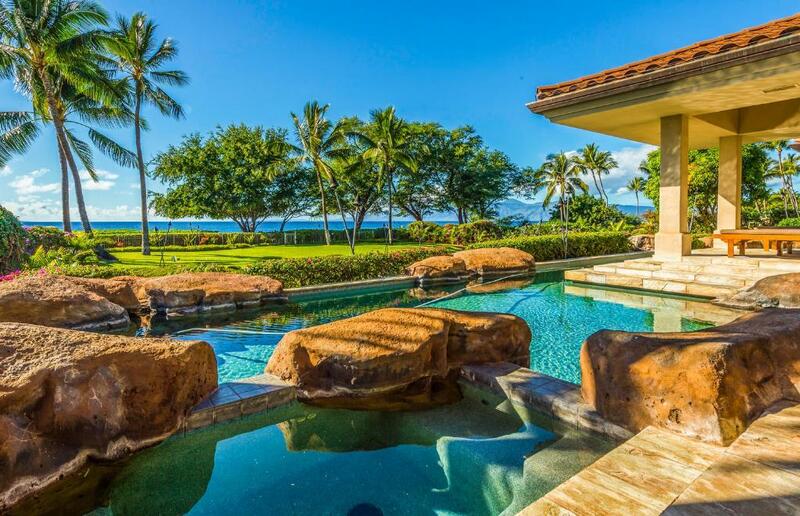 This exquisite eight bedroom estate is simply the finest Maui has to offer. Located just north of world famous Lahaina, this home is the perfect getaway for the large group or family. Equipped with a pool, and billiard room, the Kaanapali Kahala is a private mini-resort for the discerning traveler. Kaanapali Kahala is located on the west arm of three mile long Kaanapali Beach. Situated on the beach, this estate is perfect for entertaining large groups of people. Its setup is pavilion style, with enclosed grounds set back off the beach. With various pools and ponds located throughout the property, water is abundant. Two master suites overlook the ocean, and the two and a half story windows in the living room electronically open to give full sea air exposure to the interior of this house. Commonly known as the Castle Villa, this home is paradise personified. $11,000 - $14,800 per night. 50% down to hold a reservation. Balance due 60 days before check-in. $20,000.00 security deposit. $2,800.00 cleaning fee. 4% processing fee. Listed rates do not include tax. Holiday and peak season rates and required length of stay may be different than quoted above. Credit cards, cash, checks and wire transfers accepted. Minimum night stay varies amongst the various rental units. Many rentals have 30-night minimums. Tax number: TA-061-792-2560-01. The Kaanapali Kahala Estate is beyond compare from the breathtaking ocean to the spectacular architecture both inside the home and on the grounds. This home is very, very comfortable with every amenity imaginable! We have stayed at the Kaanapali Estate several times and hope to make it an annual tradition. The House Manager is wonderful, as are the housekeepers. They all took great care of us! Mary Kress from Vacation Rental Agents is the best and always makes sure that every detail is taken care of for our stay! We look forward to our return to the Kaanapalie Estate and to seeing Mary, Jodie, Sharon & Sherell soon! We had a great time. Accomodations were excellent. Very comfortable and beautiful place to spend your vacation. We look forward to coming back.